Tetrode was Flemish by birth but spent some time in the Florentine workshop of the famous sculptor and goldsmith Benvenuto Cellini. He based this dynamic composition on a well known bronze fountain group at the Villa Medici at Castello, just outside Florence. Hercules' wrestles and kills the giant Antaeus who, when not touching the ground, loses his strength gained from his mother, the goddess Gaia (or earth). Here we can see Antaeus struggling to lever himself against Hercules' head and wrest himself free of his opponent's grip, while Hercules has his arms ruthlessly locked around Antaeus' waist, waiting for him to give up the struggle by holding him in the air. 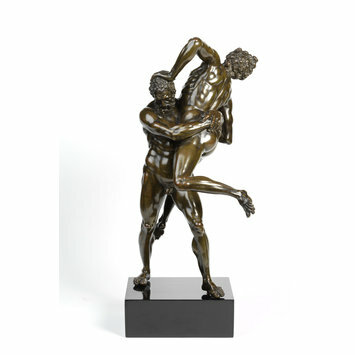 Bronze statuette depicting the giant Antaeus struggling to free himself from the grip of his wrestling opponent, Hercules. Hercules' arms are ruthlessly locked around Antaeus' waist, waiting for him to give up the struggle. Integrally cast, without external signs of assemblage and a heavy bronze thick wall. Worn dark-brown patina on the deeper sections of the surface whiile underneath is a layer of olive green with the occasional hints of red, perhaps cuprite. This statuette was bequeathed in 1956 by Dr W. L. Hildburgh FSA, one of the most prominent and generous benefactors to the V&A. Historical significance: This composition of Hercules and Antaeus is convincingly attributed to Willem Danielsz van Tetrode on the grounds of the emphatically-modelled musculature (see Avery and Radcliffe 1978 and Radcliffe, 1984). Tetrode's skill at depicting the nuances of body language, the rhythm of muscle movements and the intensity of facial expression make this particular version exemplary in its marriage of technical virtuosity and imagination. The composition developed from Bartolommeo Ammannati 's well-known bronze fountain group in the gardens of the Medici Villa at Castello that was installed around 1560. The fountain inspired several Florentine sculptors to embrace the subject and prompted Tetrode to create his own variation on the theme. While he borrowed Ammannati's composition he executed it in mirror image, placing the figures closer together to heighten the dramatic effect and Antaeus' hand on his opponents shoulder to steady himself and increase the tension. However, given that the two sculptures remain so close in composition suggests there may have been direct contact between the sculptors. 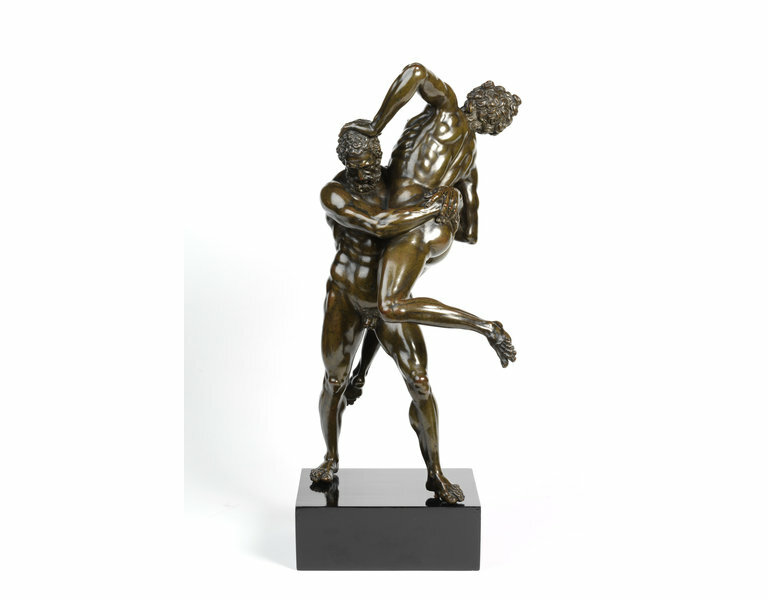 The similar model by Giambologna became one of the sculptor's most popular Hercules groups, known in several variants of differing quality, workshops and period. Herculean subjects had been much in vogue since 1560, when Bartolommeo Ammanati had succeeded in casting a monumental bronze terminal group of Hercules and Antaeus for the top of Tribolo’s great fountain at the Villa di Castello, Florence. At the same time, Vincezo de’ Rossi, a follower of Bandinelli (who had died in 1560) received a commission from the Grand Duke to create a series of twelve colossal marble groups of the Labours of Hercules, which were also originally conceived as decorations for an enormous fountain. A decade and a half later, in 1576, Giambologna was commissioned to make six silver statuettes of the Labours of Hercules, designed to decorate the walls of Francesco I de’ Medici’s Studiolo in the Tribuna of the Uffizi. The silversmith Giorgio di Antonio Rancetti (1537-1610) cast two of the six models, Hercules and Antaeus and Hercules and the Centaur, while the remaining four were cast by Michele Mazzafirri (ca. 1530-1597). These small-scale silvers are now all lost but they were inventoried in the Tribuna and are known from bronze replicas like this one by Willem Danielsz van Tetrode. Like many Netherlandish sculptors, in the second half of the sixteenth century, Tetrode (known as Guglielmo Fiammingo) was active in Rome and Florence, where he assisted in the restoration of antiques and collaborated with Benvenuto Cellini. During this period, he created a series of small-scale bronze copies of a number of antique works, including twelve busts of Roman emperors, an Apollo Belvedere, and an equestrian statue of Marcus Aurelius. On returning to Delft in 1567, Tetrode brought his enormous knowledge of Italian antiquities and Renaissance sculpture back to the Netherlands and continued to make copies. Avery, Charles, Anthony Radcliffe, Joanna Drew, Giambologna 1529-1608: Sculptor to the Medici, London: Art Council, 1978.